This might be the most expensive game of chicken EVER! Spring training for MLB teams is right around the corner and two of the biggest free agents in recent memory are still without a team to call their own. There teams to be a huge reason for that. 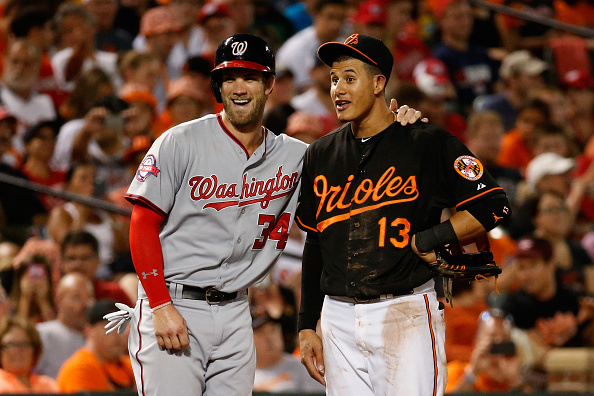 Bryce Harper and Manny Machado are seemingly in a free agent standoff, with neither player wanting to be the first to sign their contract, according to a report from Ken Rosenthal of The Athletic. Baseball clubs seem to want the stall as well as noted by Rosenthal. White Sox owner Jerry Reinsdorf, for one, would prefer to chase the market rather than set it, according to sources. That way, he could avoid a bidding war, wait until the very end to hear the number he needs to reach, then decide whether he is willing to pay. Other clubs seemingly are taking the same approach. The Phillies, sitting on “stupid money,” figure they will get one of the two stars, knowing they can top any offer. Along with the Giants and Padres in the market for both players, the Chicago White Sox, Philadelphia Phillies, and New York Yankees have all shown interest in the two free agents.